31 Days in MY SEARCH FOR BALANCE: body.mind.soul. 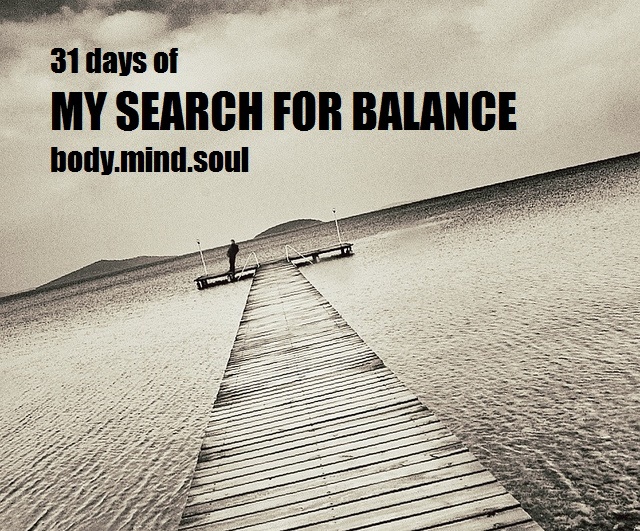 I’m calling this series 31 Days of My Search For Balance: Body, Mind, and Soul. I have accepted this writing challenge as a step out of my comfort zone, so put on your seat belt, it’s gonna be a bumpy ride . . . So I’m showing up. It’s scary, and I feel nervous and vulnerable, a little naked. But I’m here. As a woman of fifty (how the hell did that happen?) who has only recently returned to writing, accepting a 31 day writing challenge is terrifying. I just spent two hours trying to figure out what a ‘linky’ is and how to get it right. I may or may not have figured it out. I changed the theme of my blog because I wasn’t happy with the previous one, or the one before that, or the one before that, and I thought that if there is even a remote chance that more people will be reading this it should at least be pleasing to the eye. At least more pleasing than it was 10 minutes ago. I stopped writing creatively as I got older. In the past 15 years I’ve only written journals, nursing care plans, and APA style research papers. About 8 months ago I attended the Storyline conference, where I learned about living a better story. Learning about living a better story led to dreaming, and somehow dreaming led to writing. It was an unexpected joy, and it feels really good. I am ever so rusty, but I’m working out the kinks, blowing off the dust, and whatever other mixed metaphor you can think of. I feel like I’ve found my heart again. I accepted this writing challenge to step out of my comfort zone, and well, challenge myself a bit. While others have been preparing for this challenge for months, I just found out about this challenge on Day 1, so I am playing catch up (this is acutally Day 2). I have been writing about my search for balance, so this is a continuation of that journey, but now with a daily deadline. Pppppffffttttt. It makes me anxious to think about, but I hope you (and by you, I mean my husband and my two best friends who read this and encourage me consistently, and anyone else who happens along) will find this a time to think about your life and heart as I search through the chaos that is life, trying to find balance. Hello friends (and Craig), and thanks for joining me! And if we haven’t met, you can read more about me here. And did I say thanks for joining me? I really mean that, so it’s worth saying twice.